Refrigerators, hot water heaters and washers & dryers are our sixth most popular junk removal requests because they are heavy and banned from the landfill. Some of the appliances we remove can be reused or repaired others are recycled as scrap metal. Appliances can be picked up separately or included in a truck load. We offer full service or money saving curbside appliance removal. 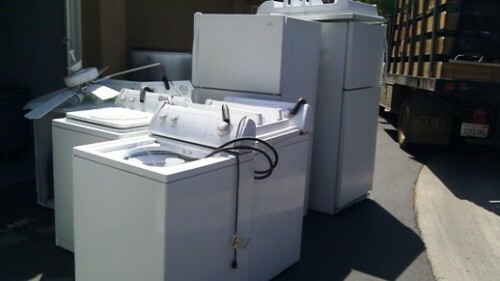 We picked up this load of appliances for an apartment complex in san Diego.